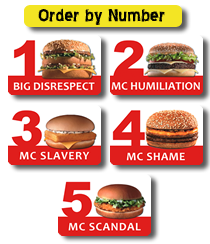 The complete picture of charges that revealed the illegal work practices of one of the major fast food chains in the world and schocked the government and the public in Brazil. NOTE: To watch the video click on Play and hold the mouse in this field. How a multinational company imprisons young people in an illegal and exploratory work scheme. Jurist who drafted the Consolidated Labour Legislation. Is McDonald’s exploiting exchange students? "I saw the video and was shocked." "I joined as a trainee, but, the truth is I was doing everything." "It is a mixture of surprise and enormous frustration. What the company does is in complete disrespect with the labour legislation (...), and violation of human rights." "Were it to be a public enquiry, they would not be stalling so blatantly." Jornada Criminosa - Sinthoresp fulfilling the 8th article, item III and enforcing the 7th article, items IV and VII, chapter II of the 1988 Constitution of Brazil's Federative Republic.